The T-100 Integrated Training System is an advanced jet trainer aircraft. Image courtesy of Raytheon Company. The T-100 trainer will be powered by two F124 turbofan engines. Image courtesy of Raytheon Company. 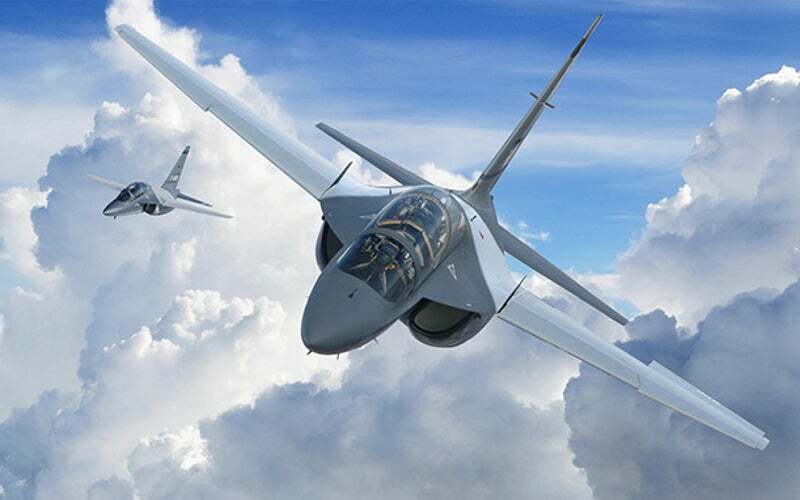 The T-100 trainer, combined with a ground-based training system (GBTS), is being offered for the USAF’s T-X programme. Image courtesy of Raytheon Company. The M-346 Master jet trainer, developed by Alenia Aermacchi, serves as the base for T-100 Integrated Training System. Image courtesy of Ronnie Macdonald from Chelmsford, United Kingdom. T-100 Integrated Training System (ITS) is designed to provide air force pilots with advanced training for fourth and fifth-generation combat aircraft such as F-35 and F-22. The jet trainer aircraft is capable of performing air refuelling, air-to-air intercepts, sustained high-g manoeuvres, night vision imaging system operations, and data link operations. The T-100 is based on Alenia Aermacchi’s M-346 Master advanced jet trainer, which has been selected by the Italian Air Force, the UAE Air Force, the Republic of Singapore Air Force and the Israeli Air Force. The trainer aircraft, along with a ground-based training system (GBTS), is being offered to the US Air Force’s (USAF) T-X advanced fighter pilot training programme, which is aimed at replacing the ageing T-38 two-seat, twin-engine jet trainer aircraft. The T-100 development team comprises CAE USA, Raytheon (prime contractor), Honeywell Aerospace and Alenia Aermacchi North America, a Finmeccanica company. Alenia Aermacchi will provide airplane platform, while CAE will design and develop simulation technologies for the T-100 aircraft. The engines will be supplied by Honeywell Aerospace through the International Turbine Engine Company (ITEC) joint venture. General Dynamics signed a letter of intent with Alenia Aermacchi in January 2013 to serve as the T-100 prime contractor for the T-X trainer competition. General Dynamics announced its withdrawal from the partnership in March 2015. Raytheon partnered with Finmeccanica and CAE USA to lead the team for the T-X programme in February 2016. A contract award for the T-X jet trainer aircraft is anticipated in 2017. The fighter trainer aircraft will feature variable camber wing design, with a wing span of 31.9ft and wing area of 253.2ft². The wings generate vortex lift and improve aerodynamic efficiency of the aircraft. The T-100 will be equipped with a retractable tri-cycle landing gear. The long, pointed design of the nose section will provide better stability and improved aerodynamic efficiency, while minimising the drag. The aircraft is 37.7ft long and 16.1ft high and has an empty weight of 11,362lbs, maximum landing weight of 20,943lbs and maximum ramp weight of 21,164lbs. It can carry weapons weighing up to 6,610lbs and will require low acquisition and life-cycle costs. It will employ a fly-by-wire flight control system to monitor flight control surfaces automatically by an electronic interface. Equipped with two engines, two electrical and two hydraulic systems, the aircraft will offer increased safety. The tandem cockpit accommodates the instructor and the student pilot in individual canopies. It will incorporate advanced avionics, hands-on throttle and stick controls, and state-of-the-art pilot vehicle interface. The heads-up display (HUD), large area display (LAD) and helmet-mounted display (HMD) units provide the pilots with aircraft control data and mission planning. The embedded tactical training simulation suite will help train the student pilots on a variety of avionics and complex missions with live virtual blended learning capability. The trainer aircraft will be fitted with tactical data links for communication through radio waves. The onboard ground proximity warning system provides terrain awareness and warning. The GBTS is integrated with advanced ground-based training components such as full mission simulator, interactive coursewares, and mission planning and de-briefing systems. It employs the same flight control software as the actual jet trainer to provide the students with theoretical and practical knowledge. "The jet trainer aircraft is capable of performing air refuelling, air-to-air intercepts, sustained high-g manoeuvres, night vision imaging system operations, and data link operations." Two F124 low-bypass turbofan engines, generating a thrust of 6,280lbs each, will power the airplane. The engines deliver a thrust-to-weight ratio of 0.91 with 50% fuel. Total fuel capacity of the aircraft is 7,740lbs, of which 4,410lbs is carried internally and the remaining is stored in three external fuel tanks. The T-100 jet trainer can reach a maximum level speed of 590ktas and a stall speed of 95ktas. It can operate over a range of 1,080nm when flying at an altitude of 45,000ft and can endure for up to 168 minutes at an altitude of 25,000ft. It can climb at a rate of 22,000ft per minute and fly up to a service ceiling of 45,000ft. The take-off and landing runs of the T-100 will be 1,310ft and 1,800ft respectively. The aircraft will have the ability to withstand sustained G manoeuvres of 8.0g at sea level standard and a g-force of 5.3g at an altitude of 15,000ft. It can perform sustained turns to a g-limit of +8 / -3g. This project forms part of our recent analysis and forecasts of the global military aircraft market available from our business information platform Strategic Defence Intelligence. For more information click here or contact us: EMEA: +44 20 7936 6783; Americas: +1 415 439 4914; Asia Pacific: +61 2 9947 9709 or via email. LMB produce a wide range of fans, blowers and motors for the transport, defence and aerospace markets with applicaitons in aircraft, helicopters, UAVs (Unmanned Air Vehicles), pods and missiles. Founded more than 60 years ago, LMB became a member of the Honeywell group in 2000.